There could not be a more fitting tribute to the eminent philosopher-historian, Dr. I.H. Qureshi, than to consecrate his memory by the continuance of his life-long mission for the benefit of posterity. A nation which forgets its heroes and scholars is soon forgotten by history. To honour the country's outstanding historian and freedom fighter, the President of Pakistan established a Foundation. Dr. I.H. Qureshi in his writings, spanning over half a century (1929-1980), dwelt at length on the ebb and tide of the Muslim power in the subcontinent, the currents and cross-currents of thought, the legacy of Muslim rule, art and architecture, administration and institutions, laws and customs and mores and traditions in an Indo-Islamic setting. Author of sixteen books and a number of research articles, Dr. Qureshi's works earned for him international repute as a historian. He held the distinguished Professor's chair at Columbia University where scholars such as Wayne Wilcox, Lawrence Ziring, G.W. Chowdhry and others took pride in having been his disciples. Earlier Dr. Qureshi had been the Professor of History at Delhi University and after the establishment of Pakistan, he served the nation for six years with exemplary dedication as Deputy Minister, Minister of State and Cabinet Minister. After his return from Columbia University, he became Director, Central Institute of Islamic Research and Vice-Chancellor, University of Karachi. During his 10-year tenure, the University witnessed a phenomenal rise in ecader.iic excellence and all round expansion as a result of the introduction of new disciplines in Arts, Science and Humanities. It was Dr. Qureshi's dream that Urdu be given the pride of place in Pakistan since it alone suits the nation's genius and he strained his every nerve to promote its development. The President, therefore, appointed him the Chairman of Muqtadara in recognition of his meritorious service to the cause of Urdu, a cause he served till his last breath. Among his works, which have won universal acclaim for their academic worth, are The Administration of the Sultanate of Delhi, The Administration of the Mughal Empire, The Muslim Community of Hind-Pakistan, Struggle for Pakistan, Ulema in Politics, Pakistan as an Islamic Democracy, Education in Pakistan etc. In his interpretation of the history of Medieval and modem India, Dr. Qureshi has successfully endeavoured to straighten out most of the distortions in respect of the works and achievements of the Muslim rulers, religious divines, and leaders to whom opinionated historians had done little justice. His exposition of the reform movements of Mujaddid Alf-i-Thani, Shaykh Abdul Haq Muhaddith and Shah Waliullah and his perception of Muslim nationalism as manifested in the thoughts and actions of Syed Ahmed Khan, Allama Iqbal and Quaid-i-Azam are based on scientific inquiry and sound judgement. While writing history, Dr. Qureshi had given Muslim orientation to the subject so that the fleeting images of a glorious past could be seen coming back to life. With an unusual insight into history, Dr. Qureshi was able to foresee the shape of things to come in the embattled subcontinent where majority rule in the name of democracy would degenerate into tyranny. His reasoned analysis of the Nehru report and its fateful consequences and the subsequent Congress opposition to Quaid-i-Azam's Fourteen Points and its reservation on the Cabinet Mission Plan, have their denouement in the creation of Pakistan. From his account of the subcontinent's history one may well conjure up the vision of an ideological state whose in-frastucture exists in the form of the Muslim heritage in the subcontinent. Needless to say that we deem it a signal honour to the University of Karachi to have been the recepient of this Chair. It will give the young generation the much-needed impetus to the pursuit of higher learning and research in the field of history. Dr. Hashmi has recently completed the research on the Constitution of Medina, a document which is popularly believed to be the covenant made by the Prophet (peace be on him) between the Immigrants and Helpers (Ansars) on the one hand and the Muslims and their Jewish allies on the other soon after his arrival in Medina. The orientalists such as Montgommery Watt and Professor Serjeant and the eminent Muslim scholar, Dr. Mohammed Hamidullah subscribe to the view that the instrument was in the nature of agreement providing for the safety of life, liberty of conscience and defence of Medina and in the event of dispute regarding the interpretation of the terms of the Covenant, the matter would be referred to the adjudication of the Prophet whose word would be deemed final. However, Dr. Hashmi's inquiry into the Covenant rejects the view that the document was in the nature of an agreement since, according to him, it was a dictation given by the Prophet on Jamadi II, I A.H. One may not agree with Dr. Hashmi's opinion but the fact remains that the students of Early Islamic History would find his thesis provocative and may pursue further research on the subject. It is interesting to note that the" Research in Islamic History" under the Dr. IJ-1. Qureshi Chair has its beginning with the Nabi/Rasul -- the beginning of all beginnings in Islamic history. I am sure that from now onward Dr. I.H. Qureshi Chair will perform its function more deligently for which it is established. The efforts presented here are the results of years of investigations in the three Continents, America, Africa and Asia. While at Harvard as Pest-Doctorate research scholar I started collecting the basic material, particularly from Ger- man sources. During my stay at Bayero University, Nigeria, as Visiting Professor, I concentrated on Arabic sources in particular because of the rich Arabic Section of the library built up by the late Dr. cAbd al-Mocid. After retirement, on being offered the Professorship of Dr. I. H. Qureshi Chair, when the Syndicate approved (June, 1983) the KITABU'P -RASUL as my first research topic, I started working in rig! t earnest and by April, 1984 I was able to present the MS of the book to the Vice-Chancellor, Dr. Jamil Jalbi. The title of the book KITABU’ R-RASUL is not my innovation but is based on the very wordings of the Text itself. Within three and half months of his arrival in the city of his choice, Yathrib, the NABI/ RASUL (al-UMM/) dicta- ted about fortyseven sentences dealing with the constitutional set-up of the City-State of his conception. Except the authenticity of this KITAB (writing or dictation) or SHIFAH (parchment/leaf) the rest of its characterstics, such as its absolute unity, singleness of its date, its mental nature, and the Three Pledges of cAQABAH and the HIJRA as its preparatory endeavours have either been totally ignored and neglected or questioned and denounced. The two elements responsible for this situation and in- justice with my NABI/RASUL are the traditional Muslim writers and the so-called 'Islamists'. The one has either over- looked the issue or misunderstood it, while Western writers through preposterous propositions and by side-tracking the issues have created confusion. Because of such impressions being the order of the day, you ask a lay Muslim or a Muslim versed in fields Islamics about the SAHIFAH, he will immediately re-act "oh, that agreement I II - but agreement with whom - with his own Followers or with the inconsequential Jewish community, or with both? As regards the internal evidence dealing with the issues raised there is neither error nor deficiency. Such evidence being irrefutable and indubitable, if the traditional writers and the Western criticism possess some extra knowledge and information, the less said the better. Love of and reverence for the NABI/RASUL and unflinching faith in his sublime achievements are no doubt noble traits of character of his Followers but Western methodology demands that his deeds and dictations, proclamations and pronouncements, decisions and judgements, commands and declarations must be scientifically examined, logically analyzed and rationally proved. Even when such honest approach melts no ice with Western criticism, what purpose simple traditional eulogy would serve can well be imagined. 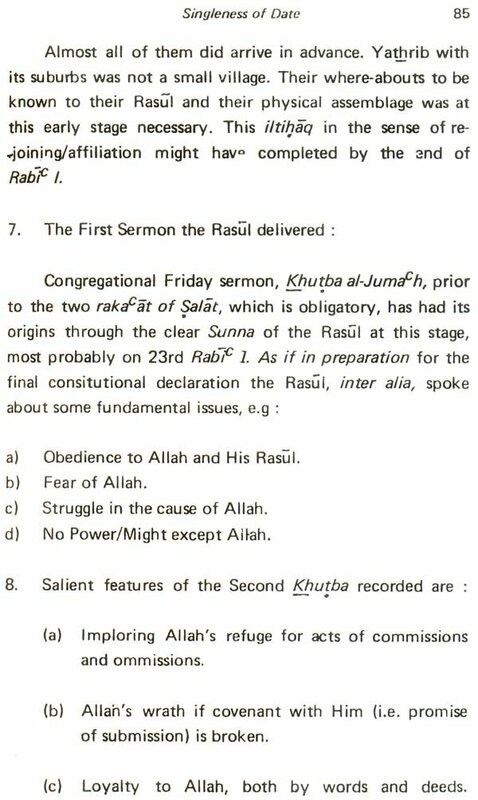 If my NABI/RASUL was disallowed by Allah to consult his followers in SHARfC AH (governmental) matters (ai-Our'an, 49:6) the prohibition must remain much more enforcible in case of the Jews. That the KITAB/SAHIFAH deals purely with SHARIc AH/Governmental matters goes without saying. The so-called Islamists or Western Criticism is a class by itself. As the saga of the KITABISAHIFAI, of the NABl al-UMMI unfolds in the following pages, it shall be clear that how the Islamists, including Barakat, suppress the facts, twist the information, misquote the original Arabic sources, wrongly translate the otherwise clear wordings, add their own whims, try to hood-wink the readers, jump to conclusions conceived in advance, attempt to minimise the greatness, brilliance and luminosity of my RASUL - and all that too in the name of 'impartial research'! "The historical criticism came to be employed in Islamic learning later than in other philological-historical fields and the wave of scepticism and over-criticism, which elsewhere has of long softened to cooler prudence and dispassionate judgement, has not modified yet in this case. At first this intellectual historical situation makes it understandable that in this sphere theories with inadmissible generalisation can be advanced which convert solitary instances into principles. To this domain belongs, e.g., the thesis propouned by Lammens (Islam: Beliefs & Institutions) that there is no other true transmission on the life of the Prophet except that in the Our'an and that the Sira is a collection of apocryphal legends. Such radical theories must be regarded as a closed chapter now. Whosoever gives to these sources their due without prejudice will find in them a treasure of historical life.' (p. 199). It is futile to hope that “a faithful history of the origin and early progress of Islam may be composed" by these Islamists, this is what von Kremer said in 1856 in his Preface to Waqidi's KITABU' L-MAGHAZI. Seldom do they seem to evince scholarly detachment so necessary to command respect and admiration. Within few month of his arrival in the city of his choice, Yathrib, Muhammad dictated a kitab or sahifah, concerning the constitutional nucleus of a society and state, for the formation of which he was working under Allah's direct guidance for the last three years, in particular. This 'istiktab' which contains about 47 Clauses or Articles - if to a single paragraph such a division is feasible - was taken down by cAli, the cousin of Muhammad on a leaf (kitab) of papyrus or parchment (raqqa). This dictation deals, inter alia, with the sovereignty of Allah, the unquestionable authority of the nabi/rasul, rights of the ummah (exclusively the mominun), rights and duties of the Jews, the protected minority, the setting in of a righteous social order, question of war and peace, the sanctity of the newly created politico-religious state and an attempt to establish positive law for punishment vis-a-vis crimes. As regards the authenticity and genuineness of the text of the sahifah it has not been made so far doubtful and questionable. There are here and there certain negligible variations in the versions reproduced by subsequent original Arabic sources through centuries. Somewhere certain prepositions are missing or added and somewhere after a/-nab/and rasulallah the invocation formula has been added. In Clause 39 instead of Yathrib the word Madinah has been written. These slight variations do in no way change the meaning, purport or connotation of the text at all. All these variations are well arranged by Hamidullah in 'his Wathii'iq2. The same learned scholar has also shown that this kitab or sahifah was the First Written Constitution in The World3, the very title of his book. Its translations are "available at least in five European languages, viz English, French, German, Italian and Dutch. At least about 26 European scholars have discussed the Sahlfah since the middle of 19th century to our own times. Lastest name to the list may be added of Barakat (1979). I must admit my unfamiliarity with any critical investigation conducted by any Muslim researcher, except, of course, Dr. Muhammad Hamidullah, in the light of western methodology or on the basis of the points raised, objections levelled and attempts made to belittle the importance of the kilablfjal)ffah, and, thereby, to minimise the ability, accomplishment and perfection of Muhammad the nabi al-ummi. For a Muslim/Momin deep rooted conviction in the risalah and nabuwwa of Muhammad is no doubt, noble trait of character but to convince the Western writers the only method is to refute their hypothesis and conclusion through that very critical system they have deployed against .he Last nabi/rasul. To shut our eyes from their writings and to produce books in traditional style in regional languages or in English may not serve the desired purpose. Their arguments and conclusions should be scientifically and logically examined and then refuted. This is what the Muslim intelligentsia and the lay-Muslim expect from the Muslim researchers. This principle applies to Islam in general and to its last nabi/rasul in particular. In this context the sahifah or the kitab, which he dictated, deserves special attention. If the kitab/sahifah was a religious dictum, Muhammad was a theologian. If it was a political decree, he was a states- man. If it was an ethical code, he was a moralist. If it was a positive law, he was a law-giver. If it was a legislative ordinance, he was a constitutionalist. If it was a defence mechanism, he was a man of peace. If it was a charter for a universal ummah, he was above race and nationality. If it was a protection for the minorities, he was a benevolent Head of state. I f it was a warning against treachery, he was an upholder of fidelity. If it had the blessings of Allah, he was a devoted c Abd. But the matter is not so simple as it appears. As was the commendable principle with early Muslim sira, maghazi and hadith writers, many of them have recorded and preserved the text of the kitab with honesty. Noteable among them are Ibn Ishaq, Ibn Sacad, Waqidi, Ibn Kathfr, Baladhurf, (Imam) Ahmed, Ibn Sayyedun Nas, Abu cUbayd, Muslim, cAbdus' Salam Haroon and Suhaili. It is only thourgh them that the text (matn) of the kitab has come down to us. While introducing the text some of these writers have added some qualifying and informative remarks about the kitab. The two muhaddithin Ahmed and Muslim have said in introduction only this much that the nabi wrote a writing between Muhajirin and Ansar. While it is only Ibn Ishaq who in his introductory remarks, apart from the above two remarks, has also added that the nabi also invited the Jews to it6• I maintain that "to invite •• does not mean here to convene or call a meeting, vide tabina in Clause 16, (those Jews who submit to us). The placement of events in Ibn Ishaq, Samhudi' and m Ibn Kathir provide a positive evidence as regards the month and year of the dictation of the sahifah/kitab. The earlier Western authorities of 19th century or the beginning of this century did not put on trial either the unity of the kitab or its authorship or its date of dictation. But our some contemporary Western Islamists and Barakat, have, to their satisfaction, exploded all the three postulates mentioned above. No attempt has been made so far to re-capitulate the internal saga of the kitabu 'r-rasul, to discuss all its Clauses thread-bare, to refute the charges of the Islamists and Barakat to acknowledge the genius of Muhammad through scientific logical and critical method. Because Hamidullah is by nature generous and refined, there should be a Muslim who is severe in his approach and un-couth in his writing to expose the working of the mind of the Islamists and to explode their conjectural hypothesis and conclusions. In the face of their adverse criticism the unity of the Sahifah, its dictation by Muhammad, its being not an agreement, its being issued during the first few months must be proved. Similarly, political, social, ethical and constitutional genius of Muhammad must be recepitulated in its pristine purity in terms of the sahifah too.